Who needs a recipe for a salad? 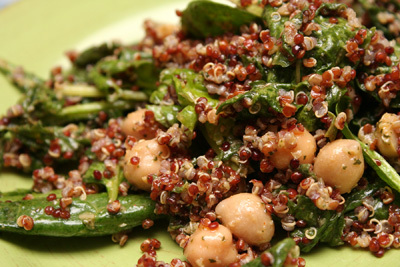 Admittedly, I tend to roll my eyes at the ridiculousness of a salad recipe: “Combine vegetables, dress them, and eat.” But allow me to defend the recipe for “Chickpea, Quinoa and Spinach Salad with Preserved Lemon Vinaigrette,” from The Perfect Pantry. I launched a winning salad with this one, using a lot of trendy red quinoa, extra chickpeas, and double the dressing. I’ve shouted about preserved lemons before, with their unforgettable tartness and intense lemony flavor. These are the secret ingredient in this vinaigrette. If and when you see a jar of preserved lemons, definitely buy it. These lemons are preserved whole — flesh, pith, and zest — by being packed in salt and their own juice for a month. The result is small, round, yellow lemons that are soft and entirely edible. The jar you buy will keep in the refrigerator for a very long time. You can figure out what to do with it later. But you’ll have that jar and you’ll never regret it. And I dare you to toss in more of these than the recipe asks for. As I said, I doubled the amount of vinaigrette here, in order to totally douse my salad. I actually used 3 cups of cooked quinoa. No complaints. At room temperature, we all gobbled up this salad. 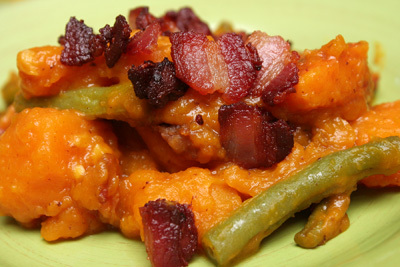 Another dish we were wowed by was the “Squash and Green Beans in Coconut Milk,” from The Ivory Hut. You’ll need to patiently prep and cook this for more than an hour, but the result is a very thick and creamy stew, thanks to the coconut milk, and squash that’s as sweet as sweet potatoes. First, I crisped my slices of bacon for 15 minutes. I left all the pork bacon grease in the Dutch oven, to cook the vegetables. Now the powerhouse ingredient in this recipe, I say, is the fish sauce. And what is this fish sauce? Well, essentially, it’s “anchovy juice.” It intensifies the bacon’s dimension of flavor in this stew. It’s another condiment jar you should keep in your refrigerator. I skipped the green chilies, in the interest of my young child’s palate. My kabocha squash needed 25 minutes of cooking to become soft. I did add 1 1/2 tsp. kosher salt. A great stew here, thick and sweet. Not yet satiated with bacon, next time I will cook the “Egg and Cheese Casserole with Leeks, Red Pepper, and Bacon,” from The Perfect Pantry, as well as the “Green Tea Infused Sunroot Soup,” from Green Kitchen Stories. See my interesting stuff when you come back to my site, soon.